Fire sprinkler cover plates, also known as covers, concealers, discs, and caps are an important and necessary part of the fire sprinkler system. 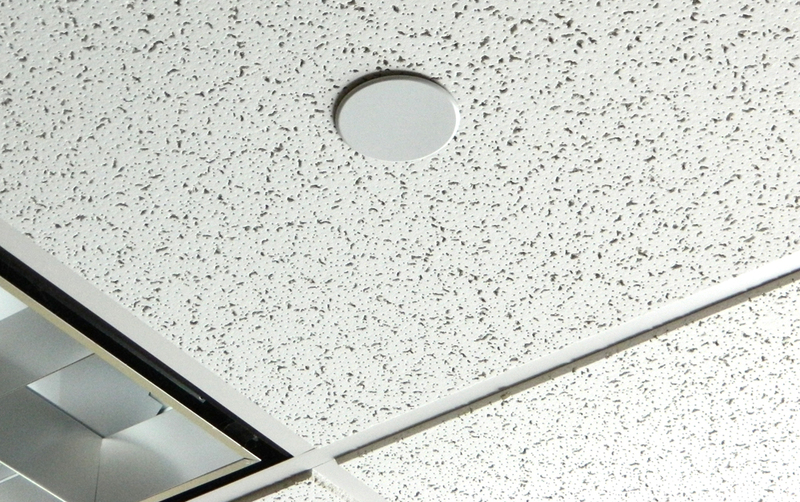 Concealed fire sprinkler heads above ceilings with cover plates not only allow for a flush finished look, but more importantly they protect the sprinkler head from accidental contact and possible activation. Cover plates differ from escutcheons as they are part of the concealed sprinkler’s assembly and specific to that assembly. 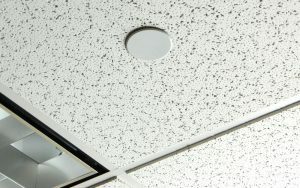 The sprinkler head assembly sits above the ceiling with the cover plate covering the ceiling opening at a flush level. The fire sprinkler cover plate comes soldered to a frame piece that screws or pushes into the fire sprinkler head assembly. The solder is temperature sensitive to melt usually 20 degrees Fahrenheit lower than the sprinkler head activation temperature. When the solder melts, the cover plate falls off allowing the sprinkler head deflector to drop below the ceiling height and distribute the water after the sprinkler activates. According to NFPA 13, 25 and 101 code, concealed sprinkler heads in ceilings must have the proper fitting cover plate assembly. Missing, damaged or improper fitting fire sprinkler head cover plates allow heat and smoke to rise up through the gap and may delay the activation of the sprinkler head. Furthermore, if smoke detectors are present, their activation could be delayed, jeopardizing early detection and life safety. This is why it’s very important to replace missing or damaged cover plates right away. Never paint or caulk fire sprinkler cover plates! Occasionally cover plates fall off or become damaged and just like sprinkler head escutcheons, never paint the cover plates. Also, never try to glue or caulk a cover plate in place. 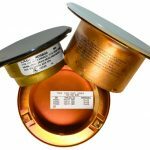 All of these substances do not react to temperature the same as the manufacture’s solder, and may cause the sprinkler head to be inoperative. 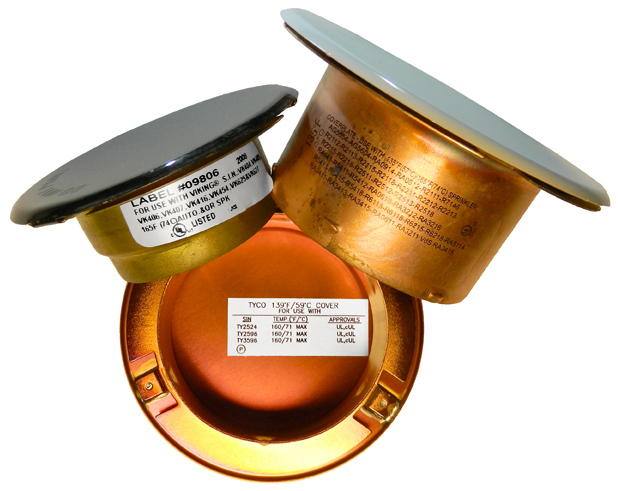 It’s important to understand that each concealed fire sprinkler model has a unique cover plate as manufacturer types vary slightly in circumference and depth. Remember that cover plates are manufactured and listed, as part of the concealed fire sprinkler head assembly. Forcing the wrong cover plate could be costly if the sprinkler head gets damaged, activates the system, releases water, and notifies the fire department. Trying to install the wrong cover plate is like trying to install a Chevy Malibu bumper on your Ford Focus vehicle, it just won’t fit. How do I know what replacement part I need? So what do you do if you have missing, damaged or painted fire sprinkler cover plates? The key to getting the right replacement cover is knowing the Sprinkler Identification Number (SIN), which identifies the manufacturer brand and model number. These alpha numeric markings are on the frame piece or on the fire sprinkler cover plate itself. See markings. Leave it to a Professional. In all cases in which your fire sprinkler system needs work, a licensed professional service provider is required to prevent accidental activation, false alarm and to ensure the system is functional and in service when the work is complete. Now that you know what fire sprinkler cover plates are and why you need them, it’s also important to know that a cover plate is NOT an escutcheon. See blog post -Escutcheons: What are they and why do I need them?